Melania Trump is no stranger to speculation, her emotionless face refusing to divulge much of anything. Even when she speaks, it’s in someone else’s plagiarized words. So, what? Is she happy in her gilded prison? Is she yearning for escape? Just how much does she retch at the thought of Donald Trump’s wet, reptilian touch? Is it so much that the White House has hired a body double to stand idly by while nightmares spills from his barking maw? That’s a theory being bandied about online today, which has found people with screen names like BuyLegalMeds.com asserting that that the woman in the accompanying footage is most certainly not the First Lady. As far as conspiracy theories go, this is a pretty tame one, especially compared to those peddled by Trumpers like Alex “Donny’s Diet Coke Is Drugged” Jones, Mike “Pizzagate” Cernovich, or Baked “I Totally Didn’t Mace Myself” Alaska. 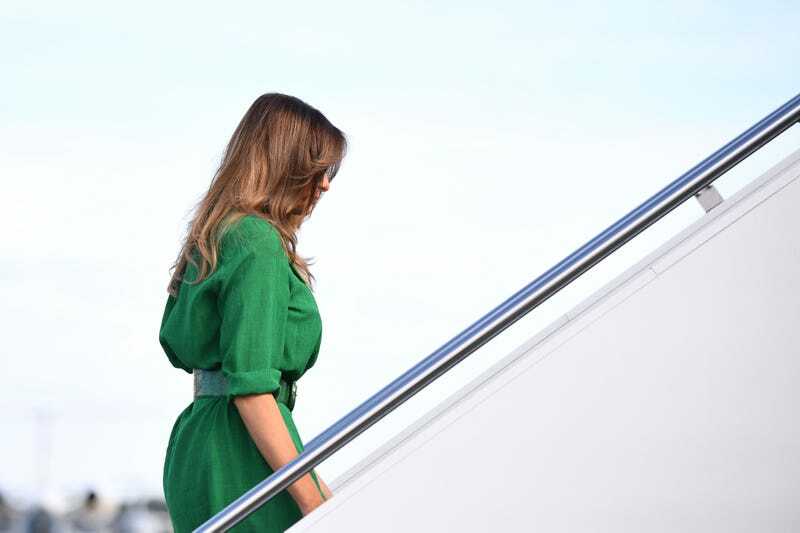 It’s also an easily disproven one, as Glamour did by simply by upping the image resolution and finding a photo of Melania sans sunglasses from later that day. But you know how this works. It’s the internet, and a thing does not need to be real to achieve sentience and momentum. In fact, its very unreality may help. With that settled, let’s revisit the weirdest Melania photo of them all. There’s got to be a conspiracy theory in there somewhere.